I wanted to take a minute to pay homage to a wonderful thing I cannot live without. 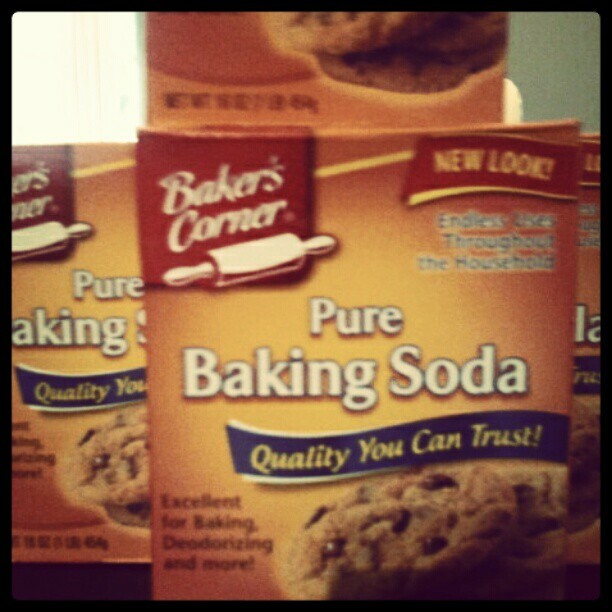 Baking Soda! I know you've probably used it for baking, science experiments, or even cleaning. But lately I've been using it to "stay fresh." In my pursuit for a natural lifestyle, I am trying to eliminate all of harmful chemical substances I come into contact with or put my family in contact with. One of my hold outs until about a year ago was anti-perspirant. I knew all of the information about how harmful aluminum was, but I just couldn't begin to comprehend my life without it. I sweat so much, just in normal life and even more so when I get nervous or exercise. In fact, I know I've hit the high of my daily workout when a huge bead of sweat comes rolling off the top of my head and hits the ground. Okay, I know that is gross, but if you consider the skin as an excretory organ--meaning that its purpose is to get toxins out of the body, then sweating is a good thing, right? I even spend 30 minutes a week sitting in a dry sauna in an attempt to detox. So here is my dilemma. I had tried the organic deodorants, the salts, all of it--with no success. So why are we trying to stop it? And what about the chemical compounds we are using to do so. Aluminum compounds or aluminum salts, such as aluminum oxide (Al2O3), are key ingredients in almost every antiperspirant. They are powerful astringents that close pores, stopping sweat and odor from escaping the body. Antiperspirants may leave the outside of the body smelling fresh and clean – but inside, the toxins that would have escaped the body in the sweat have nowhere to go. For this reason, antiperspirants have been linked to problems with the sweat glands and lymph glands in and around the underarms. What's more, "antiperspirants are designed to be absorbed"; the aluminum and many other chemicals are taken into the body and may affect the endocrine and lymphatic systems, as well as being a potential risk factor in breast cancer. I should mention the one gross part that happens in the transition. When you first start sweating after an extended period of using anti-perspirant (for me almost 20 years), the anti-perspirant that your body has absorbed will make its way out of your body. For 3 or so days, when I switched to this natural solution, I could smell all of the deodorants coming out of me. It was super nasty. I did a lot of heavy exercising during these days to speed up the process. This process was enough to convince me to never go back. If I could smell my Degree or Lady Speed Stick days after using it, I cannot imagine the amount of aluminum and who-knows-what else swimming through my lymphatic system. I'm crossing my fingers this little solution will keep working throughout the summer. We have already had some record high (97) days. I'll keep you posted, or not..maybe it is TMI! GREAT POST - i used baking soda for a while, then did a baking soda corn starch mix, which ended up being very effective as an antiperspirant - too much so and caused heat sores - since i have switched to rubbing alcohol, i think i use 70%, in a little spray bottle. 2 small spritzes keeps the odors at bay and i sweat as needed.